The third debate between Gov. 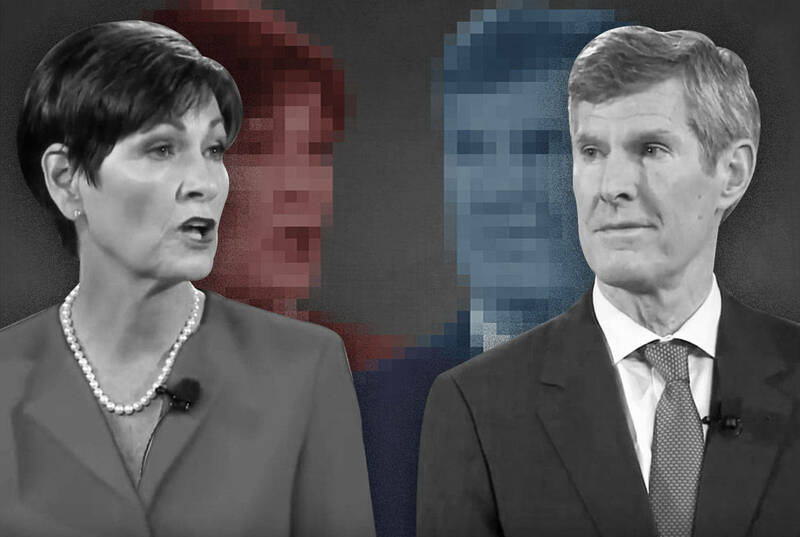 Kim Reynolds and Democrat Fred Hubbell was held at a time guaranteed to limit viewership, 8 a.m. on Sunday. That was a shame, because this was the most informative of the three debates. During the first two, the questions were on such already well-covered topics that both candidates largely just repeated lines from their campaign ads and stump speeches. But the Sunday morning debate in Davenport addressed issues that haven’t gotten much attention during the campaign and went unmentioned in previous debates. The new topics ranged from the intensely local (the politicization of the death of Mollie Tibbetts) to the national (the Me Too movement) to one affecting the entire world (climate change). Between delivering the same opening and closing statements they did at both previous debates, these were the most important new topics the candidates addressed. University of Iowa student Mollie Tibbetts disappeared on July 18, while jogging near her home in the Poweshiek County town of Brooklyn. On Aug. 21, Cristhian Bahena Rivera, an undocumented immigrant from Mexico working on a large farm in Poweshiek County, was arrested for her murder, after leading authorities to her body, which had been hidden in a corn field. Hubbell was blunt, when it was his turn to speak. “In response to your question, I think the governor’s statement was completely political,” he said. It’s not immigration, it’s not about politics, it’s about public safety. That’s what the issue here. This governor has been cutting the public safety budget for the last two years — $11 million. Do we really want to make people safe in our communities and in our homes and on our streets? Let’s fund public safety, let’s listen to our public safety officers. In 2017, the Republican-led Iowa legislature fast-tracked a bill that gutted collective bargaining rights for state employees. Now, teachers and almost all other state employees can only engage in collective bargaining on wages and not on other issues, such as healthcare benefits or workplace rules. The arbitration process that is often used to determine the final contract was also changed, to give much greater weight to the wishes of the employers. Hubbell began his reply by recapping the history of Chapter 20, the section of Iowa code that covers collective bargaining for state employees. Let’s go back to the mid-1970s. There was an agreement between [Gov.] Bob Ray and a bipartisan legislature, controlled by Republicans, for teachers and state workers to give up the right to strike in exchange for getting collective bargaining. It was a trade, it was a common agreement. It’s been that way for over 45 years, and it worked just fine in our state. We didn’t need to change it. In fact, I think it was purely for political reasons they wanted to do that. They wanted to reduce the impact of labor unions in the state, for the benefit of the Republican Party. “It has nothing to do with being good for our state,” Hubbell added, before saying he would work to restore the collective bargaining rights agreed to in the 1970s. Hubbell went first, and as he has done throughout the campaign when asked about Trump, he declined to engage with Trump’s comments. “I’m running for governor of Iowa,” he said. Reynolds answered a question in a way that echoed the Republican Party line on sexual harassment that developed during the hearings on Brett Kavanaugh’s nomination to the U.S. Supreme Court. Earlier this month, the United Nations Intergovernmental Panel on Climate Change released a report that said there must “far-reaching and unprecedented changes in all aspects of society” before 2030 to avoid catastrophic consequences from climate change. Both candidates were asked if they accepted that climate change is happening, that it is driven by human activity and that it will have a major impact on the world. Both candidates, along with Libertarian Jake Porter and independent candidate Gary Siegwarth, will be on the ballot for governor in the general election on Nov. 6.